I am a very routine type of person. I try to wake up every morning at the same, albeit via the very annoying sound of the alarm clock my mother in law gave me as a Christmas gift. Maybe she is trying to tell me something, who knows. I am, however very routine. I like to do things a certain way, have my “stuff” in a certain location and so on. The other morning as I was sitting at the breakfast table reading my newspaper I glanced up to look out the kitchen window at my vegetable garden. I had strategically placed my garden so I could view it in this manner, although my wife thinks it was pure luck. While admiring the fruits of my labor, plants with budding veggies and herbs ready to be plucked, I couldn’t help but notice some areas in the garden where I could have planted more. You see, here in New Jersey we get about five really good months of vegetable gardening weather and because it is so short I try to make the most of it by using as much space as I can through a technique which I will get into in a moment. Could I have fit in some parsnips or carrots there? How about growing some pole beans or cucumbers? Now I was driving myself crazy with the thought but I did write it down in my garden planner (my notebook I use so I can improve my garden each season). When you grow vegetables along side different varieties in the hopes of using every inch of space possible that is the art called companion planting or intercropping. It is nothing new and has been in use as far back as Aztec culture (according to Wikipedia). 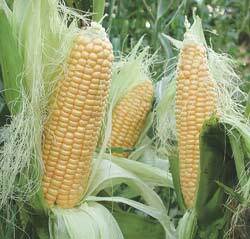 Intercropping is when you grow carrots in between your tomatoes, or pole beans in between corn. In other words, not only using that extra space, but in the case of our second example, using one vegetable (the corn) to help out its companion (the pole beans). When you use solid intercropping in your garden, you get other benefits besides more vegetables, such as less space for weeds, support for neighboring plants (such as we already touched on), and provided shade for better moisture retention. If you are going to take advantage of the space you have by using intercropping, try following these suggestions to enhance your success. Plant your heavy feeding vegetables with your light feeders. This will allow those vegetables that do not need a lot food to thrive while vegetables that require a lot can still get what they need. What would happen if you planted two oak trees next to each other about six inches apart? They would fight for ground space as their roots got larger right? Same holds true with many varieties of vegetables. So our next tip is to match vegetable plants that are deep rooted with plants that are shallow rooted. In other words the deep rooted plant will grow far beneath the soil, such as carrots and parsnips, while vegetables like garlic and onion will have their roots near the top. Take advantage of the shade that taller crops, such as corn, sunflowers and tomatoes, provide by planting cooler crops, like spinach and lettuce, beneath them. These plants do not do well in very hot temperatures, but if you can shade them a bit they will still receive the sun they will need without getting baked in it. Take advantage of every inch of space you have by implementing intercropping techniques that can help produce a more abundant harvest as well as many other benefits. Now, if I could only bury that alarm clarck in the garden, hmmm. Mike is the author of the book ”Vegetable Gardening for the Average Person” and the administrator for the largest vegetable gardening group on Facebook. Mike can be reached via his website AveragePersonGardening.com. I am not a doctor, nor do I play one on TV, but even I understand that in order for the human body to work properly it needs a daily supply of the necessary vitamins, minerals and other nutrients to give it the energy it needs to function. We as humans do this in the form of the food we eat and for many a daily multi-vitamin and mineral supplement. Plants, like humans, also need nutrients in order to function. Without the proper nutrients, plants will not be able to grow or thrive. Unlike flowers, the plants you grow in your home vegetable garden require these nutrients; otherwise they will not produce the edible harvest you are expecting. Those tomatoes and cucumbers you are trying to grow could be limited in size, flavor or even worse, not produce at all. The best way of making sure you are delivering to your vegetable plants the nutrients they need is through composting. Compost is the end result of organic matter breaking down, usually through natural means or through the help of other sources such as worms or compost tumblers. 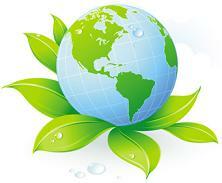 Composting is the activity by which you add compost to your home vegetable garden. When you do this, it’s like giving your garden its daily dose of a multi-vitamin or mineral. Most people do not mess around with making their own compost because they feel it is too much work. So, I have put together my three suggestions to make composting a bit easier. Shred those leaves and grass clippings. What is cooler than getting to dump leaves, twigs and grass clippings into a tool that then shreds it into tiny particles? When you do this, the organic material, in this case the grass, leaves and twigs, will break down faster. Therefore simply add it directly to your garden. Some people I know like to set the shredder up so it “shoots” the material right into the garden where they can then use a garden rake to spread it out. Bury, bury, bury! Let’s face it your family, like mine has leftovers from breakfast, lunch and dinner. Instead of throwing those leftovers away, go bury them about eighteen inches deep in your garden. Underneath your soil is an entire ecosystem that would love eat those leftovers and when they are done, they leave you compost. They did all of the work, and you reap all of the rewards, well your vegetable garden does, but you get the idea. Let the worms do all of the work. There is no better additive for your garden then compost and there is no better form of compost than vermicompost. Vermicompost is the end result of worms breaking down organic matter and then they, the worms, release their castings, which are called vermicompost. There will come a time when you simply just can’t do suggestion number two stated earlier, so you may want to consider keeping a worm farm or worm bin around, so they, the worms, can break down your leftovers for you. You can either buy the worm bin and worms, or build your own and grab some worms from your garden and put them in there. A simple Google search on vermicompost should do the trick. Stop breaking your back with that compost pile and let Mother Nature do all of the work for you. She has already put everything in place that you will need to create compost with very little effort. Vegetable gardeners have been going green long before it was main stream to do so, and no I am talking about making the plants greener in color or your neighbors green with envy. I can remember way back in the 70s when I would help my dad with his soil as he would bury our leftovers in his garden. When I asked him why, he told me that worms eat the leftovers and turn it into nutrients that the vegetable plants love. No one in the neighborhood would argue with him as many of the neighbors literally lined up for a beefsteak tomato or two. They truly were the best. Today those “leftovers turned into nutrients” is what we call vermicompost or worm castings when it is broken down by worms. Today our society is very self conscious about making sure we reuse and recycle everything. If it saves us money in the long run then let’s face it, you will get more people on board. Here are four things you can implement today that will help you get multiple uses from various items with a little help from being a vegetable gardener. I already gave you the first one and that is to compost your food leftovers. Ok actually my dad gave that one to you but he’s not writing this article so for now I will take the credit, but thanks dad! Your coffee grinds to leftover lasagna are all open game for this little technique. The only thing you should avoid are burying steak bones, ham bones etc. They won’t break down at all. However you could grind them up and turn them into bone meal, but that’s a lot of work and it could be expensive which is what we are really trying to avoid. Just dig a hole eighteen or more inches deep, put the leftovers in, and cover the hole and your done. You can easily get triple use from that plastic one gallon milk container. Obviously the first use is holding the milk. Once the milk is gone, rinse the container of leftover milk residue, fill with water and put in your freezer. It makes for a nice block of ice, especially in the summertime when you are having those outdoor barbecues and need to keep those drinks cold in the cooler. That is use number two. You can easily just keep using it for ice if you so choose, however you can also cut the bottom of the container off, and use it as a covering for your warmer plants like tomatoes or peppers. You put the milk container over them at night to protect them from cold temperatures. If you have children like I do, and they like eating yogurt, like mine do, then save those yogurt cups because they make for great starter pots. I have accumulated a few dozen yogurt cups over the years and they make for starting my plants indoors, much easier. I fill with garden soil, taken directly from my garden, put in the seeds, place them underneath a flipped over glass aquarium (that I saved from the garbage) and create an indoor greenhouse for my plants. Works like a charm! Oh, yeah, don’t forget to drill holes in the bottom for drainage. Finally, and this makes a great project for kids, is to use empty egg cartons. Not the ones made from Styrofoam, but the cardboard variety. First drill holes in the bottom of each egg cup to make sure the water drains properly. Then fill each cup with soil. Next, put your seed of choice in each cup covering them with ample soil. Add some water and place either, as before, underneath something that creates an indoor greenhouse, or on your window sill that receives sun first thing in the morning. Once the plants have sprouted and are large enough to move outdoors (weather permitting of course), take a pair of scissors and cut each egg carton cup into its own individual cup and plant the whole thing, cup and all! Sure, none of these ideas will save the world in one day but they will help save you a little time, some money, add nutrients to your soil and help you do a fun project with the kids. Enjoy! For many years the tomato was classified as a vegetable. Not for scientific reasons, but for reasons that simply made sense. Most fruits you simply pick up and eat, such as an apple or an orange, but as for the tomato, not many pick up a beefsteak or big boy hybrid and start munching, my wife excluded, she loves to eat tomatoes. Tomatoes are botanically classified as a fruit but because of their savory flavor many still refer to this popular food as a vegetable. Tomatoes are so popular in the home vegetable garden that the USDA has noted that over eighty percent of all home vegetable gardens grow some variety of tomato, and that is more than twice the amount of the next most popular vegetable the cucumber. We’ll talk about the cucumber in a future article or podcast. With all of this said, how well do you really know the tomato and what you are growing? Here are ten facts pieced together that you’ll find interesting that will make you look at the tomatoes you grow in your home vegetable garden a little differently. Yes, there will be a test on this, so listen carefully. The tomato is part of the nightshade family and that makes the tomato a close relative to tobacco. If you ever want to think of two plants that are worlds apart in use this is probably it. Since they are so closely related, tomatoes are susceptible to various diseases that are tobacco related such as the tobacco mosaic virus. Have you ever wondered why you might not be having success with growing tomatoes on your patio? It could be that your plants are not receiving the full sun they need in order to grow. I read a story once where tomato plants grew extraordinary large in Alaska due to the twenty four hour sunlight. Tomatoes require sun and lots of it. The more you give them the happier they will be. Have you ever taken a pH reading of your soil where you plant your tomatoes? If not you should definitely do it. Tomatoes love the soil to be a bit more acidic then most vegetables. A soil level in the 5.8 to 7.0 range would be ideal. You can get a pH soil test kit from your local home or garden center for less than four dollars. Stop! Before you plant another tomato seed what are the temperatures like in your area? Tomatoes like hot weather. The more hot and humid it is, the better it will be for the tomato. It’s probably why we do so well with tomatoes here in NJ. Start your tomato seeds indoors and when the temps remain steady at 70 degrees Fahrenheit during the day and 55 degrees Fahrenheit at night you can move them outside. Many people think the tomato is native to China since they are the world’s largest producer of them. However, early historical recordings show the tomato originating in South America. Where does the USA rank as far as total tomato production? The USA ranks a distant second to China producing over twelve million tons of tomatoes per year. Maybe you aren’t a fan of large tomato varieties such as the beefsteak, or even the small ones such as cherry or grape. You are in luck. You don’t even have to be a fan of the red ones. There are over 7,500 varieties of tomatoes you can choose to grow that range in size, shape and color. It truly is a vegetable, er um, fruit, that gives you plenty of options to choose from. Some 500 years ago, the tomato was believed to be poisonous. Today we could not even imagine life without it. It is used in soups, sandwiches, pasta dishes, you name it. However even though the tomato fruit is edible, the leaves, stems and green unripe fruit contain a poisonous alkaloid called tomatine. Because the traces of tomatine are so small it is basically harmless to humans and the reason why fried green tomatoes are ok for consumption. Just don’t eat large quantities of them raw. So there you have it ten fun filled facts about the tomato you may not have known before. After learning these tidbits you may not look at the tomato plants in your garden the same, ever again. Our own Mike Podlesny, author of the book "Vegetable Gardening for the Average Person" and administrator of the largest vegetable gardening group on Facebook, will be holding a 2 hour free class at the Burlington Country Library Westampton Campus in Westampton, NJ on Thursday May 27th, 2010. This course provides a fundamental working knowledge of the varied aspects of home vegetable gardening. This course prepares students to start and maintain a home vegetable garden. Students will increase their awareness of what types of plants grow well in the area and simple techniques to enhance success. By itself, I believe celery is very bland and tasteless, but throw some peanut butter on it and all of a sudden you get a crispy, crunchy, healthy snack. Celery is so versatile because it can be added to a variety of dishes, such as soups and salads, to actually add flavor. 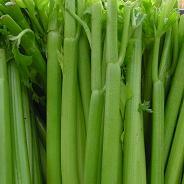 Celery has been dated as far back as 30 A.D. where it was written that celery seeds were used as a means to relive pain. More recent studies show that celery contains a compound called 3-N-butyl-phtalide that has shown to reduce blood pressure in rats, so maybe back in 30 A.D. they were on to something. Beyond all the background and scientific data on celery you will find it most interesting if you enjoy vegetable gardening like I do, that growing celery is easier than you think. If you are going to give celery a try in your next growing season, here are some tips to help you out. As always, start with an excellent foundation and that is your soil. Make sure your soil is in the 6.0 to 7.0 pH range. That makes it neutral to slightly acidic. You can test your soil’s pH level with a $4 home testing kit available from any home or garden center. Always start your seeds indoors. They will have a better chance for survival and once they have germinated they will more easily adapt to the environment in which you are going to move them to. You can start them indoors as early as 10 weeks prior to the final frost of the season in your area. When you do plant your seeds indoors, because celery seeds are very tiny, you can just slightly cover them with soil with very little soil. Do not bury them deep as they are not large enough to produce enough energy to break through large amounts of dirt. You are ready to move them outdoors when day time temperatures remain steady above 70 degrees Fahrenheit and night time temperatures do not dip below 60 degrees. Should temperatures fall below 60 make sure you cover them to protect your celery from the elements. Space your celery plants out at least eight inches to give them plenty of room to grow and thrive. A weekly heavy watering schedule combined with adding a fresh supply of compost to ensure they receive the high amounts of nitrogen, potassium and phosphorous they need should do the trick. Celery makes for a great companion to plant to nearly all vegetables. However in a plant rotation avoid following members of the cabbage or lettuce family. As you can see adding celery to your home vegetable garden is not that difficult of a task. Just follow these tips and suggestions and you can be adding fresh celery from your garden to your next plate of Buffalo wings. How Do I Get Rid of Squirrels in My Vegetable Garden? Continuing our series on annoying animals in the vegetable garden, we move on to those lovely of lovely rodents the squirrel. Forget about a fence and aluminum pie tins for these animals. They will climb over the fence and probably use the aluminum pie tin as a plate for all the fruits and vegetables they are going to steal from your garden. Here are some solutions you can give a try that are safe, realistic and work. Do you have a dollar store or an inexpensive toy store near your house? Then you should definitely take a trip there and pick up some realistic looking garden snakes. A number of fellow vegetable gardeners on our vegetable gardening Facebook fan page suggested that using rubber snakes really works. Every morning go to the garden and move them in a different location to confuse the squirrels. It is an inexpensive and safe way to deter squirrels from your garden. Just don’t scare the kids with them. It is dry powdered blood and is normally used in adding nitrogen to the soil. However, blood meal also serves as a pretty good deterrent to a rodent like the squirrel. 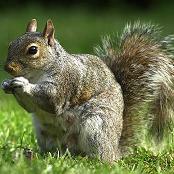 Usually derived from cattle blood, squirrels (and rabbits) sense sort of danger when blood meal is around and avoid the area. By spreading blood meal over your garden, you can add nitrogen to your soil and deter the squirrels. Some may not agree with this method, but many do use it and that is to feed the squirrels at the other end of your yard. My father used this tactic all the time and it seemed to work for him. He would feed the squirrels on one end of the yard, as far away from his garden as possible, so that they would go there and never actually get to his fruits and vegetables. You can set a simple pie tin with peanuts in it to feed them. I believe using a combination of all three of these methods will work wonders for you especially if you have problems with squirrels in your home vegetable garden. You can get the rubber snakes at the dollar store, the blood meal at your local garden center and peanuts at your supermarket. All three are very inexpensive and easy to implement. As a side note, avoid using poison. Not only is it inhumane but really unnecessary, expensive and dangerous. You could possibly kill other animals besides the squirrels. Give the three previously mentioned options a go today, and you will be well on your way to a healthy and squirrel free home vegetable garden. The word armadillo comes from the Spanish meaning, “armored one”. They are placental mammals and have a leathery armor like shell. There are about 20 different species of armadillos and vary in size including giant armadillos which can weigh as much as one hundred thirty pounds and grow up to five feet in length. The United States of America has but one known species of armadillo present, found mostly in Texas, but can be seen in other south central states ranging from as far east as Florida and far north as Nebraska. Armadillos are diggers. They have large sharp claws which allow them to dig for a food source such as grubs, which brings us to why you may have a problem with armadillos in the first place. If you see an armadillo in your home vegetable garden, chances are you have another issue beneath the soil that brought them there in the first place, and that is grubs. Grubs in your underlying soil are usually the result of beetle larvae and if left not taken care of, forget about the armadillos, the beetles themselves, when the larvae mature, will wreak more havoc on the home vegetable garden. The first instinct might be to leave the armadillo alone since they are eating the more destructive problem. 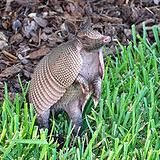 The only issue with this is armadillos dig and do not care that they rip your plants out of the ground. So the first step is to get rid of the grubs which will also get rid of the armadillo. You could use a chemical based grub remover but if you are trying to maintain an organic garden, this may not be the way to go. Start with adding beneficial nematodes to your home vegetable garden. They feed on the grubs for food. Nematodes can be found in your local garden center or online. If nematodes are not available in your area or too costly to ship to you, look towards using milky spores. Milky spores are bacteria that infect the grubs with a paralyzing disease. When the grub dies and breaks down, it releases the milky spores to move and infect more grubs. This process continues until the grubs are gone. Milky spores occur naturally, so they are safe for your garden and the environment. Once you have removed the grubs, then use some ground vibration techniques that we talked about in a previous article on controlling moles and the armadillos will move on. Probably to your neighbor’s house, but that will be his problem. Give these a try to remove the armadillo problem you have in your home vegetable garden. You can could be both grub and armadillo free in no time. 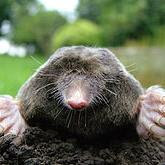 Members of the Talpidae family, moles, the ones we are talking about here, burrow into the ground, are covered in a grayish to brown fur and have tiny eyes that allow them to differentiate between night and day. Regardless of what you many have heard moles aren’t in your home vegetable garden because you grow great tomatoes. Moles primary source of food are earthworms. Unfortunately for the mole, earthworms rank higher on the importance scale for the home vegetable gardener. Therefore if you have a mole issue, it needs to be addressed, because a garden’s soil without earthworms is like your car and no fuel. Not our method of choice, but when we posted this question on our Facebook fan page, we received dozens of responses of using a shot gun. If this is something you feel comfortable with and your local laws allow it, then by all means go ahead. Yep, they just aren’t for rats anymore. You can lay a few of these traps out with the bait of choice, in this case earthworms, and they do an excellent job of getting the moles. Don’t be surprised however if you do get some moles in the trap and they get cut in half. Rat traps are very powerful, so be careful. Although Christopher`s suggestion of napalm was intriguing, we decided to go with something a little more humane, less destructive and safer and that is causing ground vibrations. There are a couple of ways to do this. One of our Facebook members took 20 ounce soda bottles, drilled holes in the bottom for drainage, and buried them about halfway down and three feet apart from one another. As the wind blew the plastic bottles they created vibration which kept the moles out of his garden. You could also purchase vibration rods to put in the ground which has the same affect. Anyone of these ideas will do the trick, but you could always go with Stan’s suggestion and sit out by your garden in a lawn chair with your pitchfork in one hand a favorite beverage in the other, wait for the mole to pop up, and well, you get the idea. Moles can do damage to your home vegetable garden in ways that might not seems obvious, but rest assure the damage they will do, can wreak havoc on the underlying ecosystem and create problems for your plants. Follow some of these suggestions above and you will be well on your way to a mole free home vegetable garden. There are a number of uses for this great fruit of which my favorite is in pancakes. Blueberries add a nice flavor to almost everything. They are a good texture and very sweet. If you are a home vegetable gardener like I am, and are a fan of blueberries, then you really should consider adding a bush or two. Before you get started growing blueberries you must understand that you will need to put a couple of seasons in before you can reap the benefits of a bountiful blueberry harvest. You will more than likely not see anything in the first season, and a slight chance in season two. It will be season three and beyond that you will really get your blueberry fix. Start by making sure you plant two or more blueberry bushes, various species if possible, at the same time to encourage cross pollination. Also, when you plant the blueberry bushes make sure they are no closer than four feet. Five feet would be ideal. Blueberry bushes love acidic soil and your soil should be under 5.0 on the pH scale. If you are not sure what your soil’s pH level is then obtain a pH soil testing kit from your local home or garden center. If you need to lower your soil’s pH level, powdered sulfur will do the trick, however read the recommendations on the pH test kit to see what they recommend to use in your area of the world. When the soil is sandy, blueberries will thrive, which is why here in the State of New Jersey in the good ole US of A, blueberries do very well, especially more towards our coastal areas. On a side note if you are ever in New Jersey, visit Hammonton, the self described blueberry capital of New Jersey. They grow and sell loads of them. Make sure you remove all weeds in and around the blueberry bush. If your bushes have to compete with weeds for water and nutrients they, your blueberry bushes, will lose that battle. Also, do not overwater. If you soak the roots, they will get root rot and your bushes will die. Now, after all of that hard work, area preparation, maintenance, and the three year wait, you should and will see a great harvest of sweet tasting blueberries. The only problem you will have now is deciding whether you should put them on your morning cereal, in your pancakes, or baking yummy blueberry muffins or one of my favorites, blueberry cheesecake. Enjoy! What Can I Plant to Attract Bees and other Beneficial Insects to my Home Vegetable Garden? We live in a society now where more vegetable gardeners then not look for natural means to grow safe and healthy food. Long gone are the days of using chemicals in the backyard vegetable garden to produce the food you want to put on the table for your family. If you are one of those vegetable gardeners that think the non chemical means is a harder more labor intensive way to grow vegetables, you would be right. Well sort of. The labor will come from all of those beneficial insects, bacteria, worms and other creatures you are going to attract to your vegetable garden, and they will be the ones that actually do the work. For instance, if you bury your left over supper in your ground (at least 18 inches deep), there is an underlying ecosystem beneath the soil such as microbial, bacteria, and worms that will break that dinner down into useable healthy compost. All you had to do was dig the hole, drop your left overs in, cover the hole and walk away. Not very hard now was it? Another such way to make your vegetable gardening life easier is to attract that beneficial insect, the bee. Bees fly from one plant to the next looking for the nutrients they need for their own livelihood. 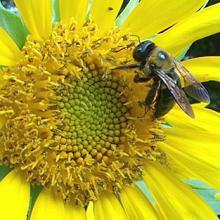 While doing so a great thing happens along the way that is beneficial to your garden and that is pollination. Most of the time bees show up out of nowhere but in most gardens they don’t stay because there is not enough of what they are looking for to stick around. There are a number of flowers you can grow that will not only attract bees to help with pollination but also are deterrents for other insects such as green flies and certain aphids and those flowers are marigolds. They come in a variety of colors and will work wonders for your garden. A perimeter of them will do the trick. You can also plant sunflowers to attract bees (I like the Giant sunflowers that can grow as much as ten feet tall). Now of course you don’t want to over do it. Bees can and will sting if they feel threatened so plant enough to attract for the amount of bees you will need based on the size of your garden. Butterflies are another species of creature that can be extremely beneficial to the home vegetable gardener. Lavender works well for butterflies, but if you really want to attract them, plant a butterfly bush nearby. Round out your healthy garden by attracting some ladybugs by planting some fennel. Ladybugs feed on aphids which could be extremely harmful to your plants. All you have to do is put in place the items you will need to attract the correct insects to your garden and they will do the rest. Then you just sit back let them take care of the garden (sort of) and pick your ripe fruits and vegetables. How do I Stop Birds from Eating My Vegetable Seeds? They are one of those creatures for home vegetable gardeners that you love to have them around, but at the same time wish they would leave your home vegetable garden alone. They are birds. They come in all shapes, sizes, colors and of course eating habits. In my area sparrows and robins are the most common birds. On occasion we will see a cardinal or a blue jay and if we get really lucky an oriole that somehow got lost to where ever it was originally headed will stop by. I am no bird expert but I do know that birds can be extremely beneficial to a home vegetable garden and detrimental as well, especially when you start your seeds outdoors. I have a couple of solutions of my own to deter the birds from eating my seeds, but I wanted to get the input of our vegetable gardening fans of Facebook. So I simply posted this question, “How do I stop birds from eating my vegetable seeds?” Here are the results of this question. Let’s start with the aged old, scarecrow. Now I did receive a number of different ideas of making a good scarecrow, but the consensus was to make one in such a way that the arms were straight out, parallel to the ground, and that you should hang something off of the arms that would blow in the wind and make some noise, such as aluminum or tin pans or windsocks with chimes. Bruce suggested what seemed to work for him and that was the use of rubber snakes. I have never personally tried it so I can’t say for sure whether or not this method will work, but Bruce said to move the snake around to different parts of that garden. He seems to have success using this method and you can pick up some rubber snakes at your local dollar store. You can also create a cover for the seeds by using plastic water bottles, empty gallon plastic milk containers and so on with the bottoms cut off to create a greenhouse type of affect for your seeds. It also prevents the birds from getting to them. And of course the ultimate solution if you do not want the birds to eat your seeds is to start your seeds indoors and when they are large enough, move them to the outdoors. If you never put the food source there in the first place you shouldn’t have any issues with the birds eating your seeds. 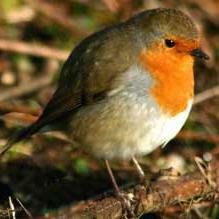 Yes birds can wreak havoc on your garden if they swoop in and eat your seeds, but birds are a necessity because they also eat the harmful insects that a vegetable garden attracts (harmful to the garden of course). Follow some of these ideas mentioned here and you will be well on your way to making sure the birds are your allies in keeping a healthy, safe and fruitful home vegetable garden. Mike is a 3rd generational home vegetable gardener and author of the book Vegetable Gardening for the Average Person. He has been vegetable gardening himself for nearly 30 years and his vegetable gardening tips and tricks have been featured in newspapers, magazines and blogs around the world. Mike has also appeared on ABC, NBC and Fox Business talking about vegetable gardening and the Seeds of the Month Club. He also hosts the popular weekly podcast, "Vegetable Gardening with Mike the Gardener", which can be downloaded from iTunes.